tours are a great choice! organization, and excellent guides for the route. so that you can properly enjoy your flexibility. Travel Club, which has arranged active vacations and special interest tours along the Vienna-Prague Greenways since 1996. Our main programs are Central Europe bicycle tours for small guided groups and individuals. 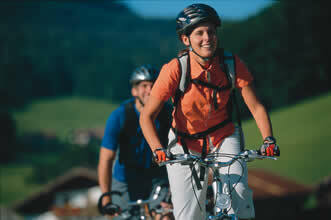 We offer cycling vacations in the Czech Republic, Slovakia, Hungary, Poland, Germany and Austria. We specialize in self-guided bicycle tours in Central Europe with comprehensive navigation and details of local services - we live here after all! destinations. We simply organize tours in the place we know best - where we live. We have been developing our tours, based on a detailed local knowledge of our region, since 1996.
ease using English route descriptions, detailed maps and precise GPS satellite navigation. Efficient stand-by support via cellphone, selected accommodation, smooth luggage transfer, and Trek or Scott bikes complete the package. Choose the most convenient time for your cycling trip and we will arrange it for you. Our bikes, the world-renowed Trek and Scott models, come in all sizes in both men's and women's frames. The combination of the two brands makes for broader spectrum of frame sizes, and provides a more exact fit on your ride. We take good care of our bikes because we believe a quality bike is the cornerstone of a quality ride. Our strategy is to use only, local guides on our guided tours. This means, people who know a lot about their country, and have lived through the incredible changes that Central and Eastern European countries have faced over the years. provide for this level of service and expectation. in major cities or capitals that are great destinations in and of themselves. Central Europe (Dresden - Prague - Vienna - Budapest - Cracow). picturesque towns and villages with historical monuments to make a cycling paradise. residences is perfect for lovers of history and Old Europe. • Variety of landscape. It is refreshing to see the countryside change while cycling - from deep forests, through lake and wetlands to highlands, river valleys and wine country. capitals. There are international airports in Prague, Vienna, Budapest, and Bratislava. 1989, the level of service has greatly improved to satisfy even the discerning traveler. • Compact "human" dimensions are well suited for cycling and walking tours. Easily cover the distances between towns, and get to know the towns, villages, and countryside of Central Europe up close.